BankruptcyWatch, a leading bankruptcy data, and monitoring service, recently signed a joint partnership agreement with Infinity, an all-inclusive loan solutions platform. The partnership is aimed at further boosting Infinity’s state of the art lending software system which helps lenders (primarily payday and short-term lenders) obtain a fast, comprehensive and accurate information about loan applications. As a result of this joint effort, Infinity users no longer need to waste time dealing with the bankruptcy court when processing applications. BankruptcyWatch now provides Infinity with seamless, embedded and real-time bankruptcy information directly from the court database. “This new data capability benefits Infinity users because they now get live-access to bankruptcy information and perform instant bankruptcy checks resulting in a faster, more reliable and accurate decisions when processing loan applications or collecting on a potentially bankrupt debt,” said Lance Wickham, President of BankruptcyWatch. Infinity offers a host of services focusing on short-term, long-term, title and other types of lending. Their clients include lenders of all sizes who want an all-inclusive fast, and hassle-free underwriting and loan management experience. BankruptcyWatch offers a comprehensive, live and accurate bankruptcy data and monitoring service to clients. Infinity’s software solution, meanwhile, covers services such as loan reporting and analysis, marketing, loan payment processing, collection, email and text messaging among others. To learn more about how BankruptcyWatch can help your organization, email sales@BankruptcyWatch.com, visit BankruptcyWatch.com or call them at 1-888-895-1328. For more information about Infinity’s lending software services, email sales@infinityels.com, visit Infinityels.com or call them at 1-866-792-3682. BankruptcyWatch & ZipReports are pleased to announce that they have come together to incorporate live bankruptcy data into tenant and employment screening reports. This addition to ZipReports is aimed at improving access to bankruptcy court information for landlords and employers alike. One of the primary goals is to provide faster, more reliable and accurate reporting to those who need bankruptcy data to make decisions and for ongoing monitoring. BankruptcyWatch is a leading bankruptcy data provider and ZipReports is a popular tenant and employee screening service based in California. “We are pleased to offer our premiere integrated and comprehensive bankruptcy data service to ZipReports. This partnership will streamline the process and allow ZipReports clients to be confident that their bankruptcy information is current and accurate,” said Lance Wickham, President of BankruptcyWatch. Rezan believes the initiative will save employers and landlords time and effort. It also allows them further clarity into the financial track record of candidates and prospects. Rezan noted that with the increased costs and procedures required, it is becoming harder to obtain a credit report. 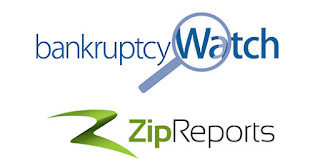 With BankruptcyWatch as a partner, ZipReports clients can now collect bankruptcy information in real time without being required to order a credit report. Fast and accurate bankruptcy reporting is important not only to landlords but also to employers and their Human Resource (HR) department. This is especially true in situations where bankruptcy information can provide important clues in determining whether an employee can perform well on the job. Increased efficiency - ZipReports now incorporates accurate and timely bankruptcy information into their reporting, saving their clients the hassle of manually checking the bankruptcy court system or dealing with additional authorization forms. Reduced risk - BankruptcyWatch data allows landlords and employers to better understand the financial picture of their candidates. This translates to saving money, time and effort down the road. Enhanced decision-making - Through the timely and accurate data provided by BankruptcyWatch, ZipReports users will enhance their ability to make decisions. Whether processing applications, renewing a lease or keeping track of an employee’s bankruptcy status users now have a direct and easy way to check bankruptcy info. To learn more about how BankruptcyWatch can help your organization, email Sales@BankruptcyWatch.com, visit BankruptcyWatch.com or call them at (888) 895-1328. For more information on ZipReports and how they can simplify and streamline your screening process, email Service@ZipReports.com, visit ZipReports.net or call them at (800) 311-1585.